Dr Shabana Haque, Head of the Government Science & Engineering (GSE) Profession Team, describes their innovative communications solution for raising awareness of the profession and the value that scientists and engineers can add to government. What is the GSE profession? The Government Science and Engineering (GSE) profession is one of five government analytical professions in the Civil Service that provide evidence-based advice for developing government policy and supporting operational delivery*. 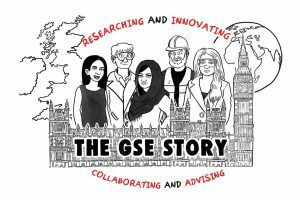 Managed by the GSE Team in the Government Office for Science, on behalf of the Head of Profession, Sir Mark Walport, the GSE is made up of over 10,000 civil servants with a background or interest in science and engineering. They work in a range of specialist, policy, analytical and operational roles at laboratories and institutes across the United Kingdom, tackling global problems such as poverty, disease, climate change, crime and terrorism. As a profession, we have a problem of perception. When people think of government scientists and engineers, they still tend to think of men and women working in lab coats and hard hats far from the centres of power. We know our work involves much more, with people in the field and at the top levels of government, not only researching and innovating but collaborating with policy officials and advising ministers. At the same time, we need to tackle the communications challenge of galvanising a diverse group that is a single profession in name only, consisting of probably over a hundred distinct science, engineering and technology disciplines. Overall, our aim is to raise the profile of the GSE; correct misconceptions so that we can attract new talent to the profession; build a stronger sense of belonging among the disparate disciplines within GSE; expand our expertise; and fulfil our main objective of adding value to government. We have just published the GSE five-year strategy, a blueprint for the future of the profession. This is the first time the GSE profession has articulated a vision and statement of intent in this way. So, ensuring it was fit for purpose was paramount. This presented a communications challenge familiar to many parts of government. Strategies emerge from Whitehall with some regularity. How could we help ours ‘land’ with real impact, galvanise the profession, build pride in our achievements and raise awareness more widely? Because we wanted to appeal to a wide audience, including people from non-technical backgrounds, we decided to tell the story of science and engineering, but to tell it in a different, more accessible way. 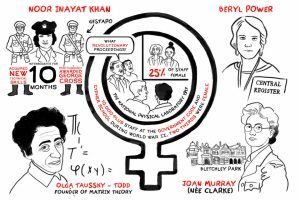 We chose the immediacy of the visual to tell the GSE story in pictures; the story of scientists and engineers in government, charting their successes and achievements through history, and championing diversity and inclusion. Through colleagues in the Cabinet Office, we contacted a creative company specialising in cartoon visualisations to translate complex ideas into accessible, visually stimulating stories. They have global clients in the private, public and third sectors, including the Royal Society of Arts, the BBC and the Ministry of Defence. Many of our stakeholders initially struggled with the idea of a picture-led story, ironically finding it difficult to visualise. They had strong views about what the story should show, but were concerned about oversimplifying the message; that important social, economic and political aspects, such as the valuable contributions made by women and individuals from BAME communities, would be missed. We listened to their concerns and produced a case study guide with selection criteria and exemplar case studies to help stimulate ideas; and we worked with stakeholders to help them develop good case studies. We invited historians to peer review the historical examples to ensure factual accuracy, and this helped us build trust with stakeholders. In just six weeks, we collected over 60 rich case studies from across the scientific, engineering and humanities communities. Working with the supplier we created a storyboard and narrative, distilling all the information we had collected into 12 Powerpoint slides. With so many strong case studies, the challenge was selecting the best ones and weaving them into a coherent, inspiring and visually appealing story. We felt it was important to include examples of where brilliant innovations and discoveries in science and engineering had changed the course of history. The history of formal, organised scientific endeavour in this country goes back a long way. We chose to start our pictorial account with government’s relationship with the Royal Society. Founded in the 1660s, the society counted Isaac Newton among its members (he later became its President); and John Harrison, celebrated for overcoming the enduring problem of measuring longitude at sea, demonstrated one of his first marine chronometers there. Both are depicted in the story. We felt it equally important to shine a spotlight on unsung heroes, whose tireless work behind the scenes, often in the face of adversity, contributed to ‘Eureka’ moments now attributed to others. We chose the example of Caroline Herschel, sister of the eminent Astronomer Royal, William Herschel, who became one of the first women to gain international recognition as a scientist in her own right. Throughout the GSE Story, we have showcased examples of strong female role models, who carried on their work with unswerving determination, often regardless of their own welfare and safety. We have also included examples to remind people of how government scientists and engineers have historically been at the forefront of change, exploring, inventing and innovating, often at times of economic, financial and social instability. For example, during the 1970s financial crises, the fuel price shock and social change led to closer collaboration between government, industry, universities and international partners. It was the "age of Concorde" and commercial supersonic flight. The story moves on to the GSE profession today. 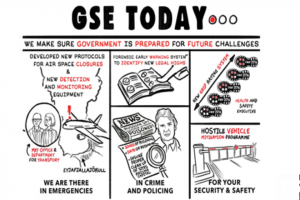 We deliberately emphasise the modern role of science with three slides, showing the GSE's commitment to supporting government in responding to change, preparing for future challenges, and protecting the public good in areas such as crime and policing, security, innovation, public health and climate change. The final image depicts our Head of Profession's mission: the blueprint for the future of the profession and the basis for producing the GSE Strategy. In 2010, the Scientific Advisory Group for Emergencies (SAGE), chaired by the Government Chief Scientific Adviser (GCSA), advised on the hazards to air travel caused by the eruption of Icelandic volcano Eyjafjallajökull. At the same time, scientists and engineers from the Met Office and Department for Transport worked with academia, industry and regulatory bodies to develop new protocols for airspace closures and new detection and monitoring equipment. During the Ebola outbreak in West Africa, UK Government scientists were at the forefront of the international response. The Defence Science Technology Laboratory (Dstl) provided scientific analysis to help optimise some aspects of the response. The Health & Safety Executive coordinated the establishment of Ebola Treatment Centres. HSE, Public Health England (PHE) and Dstl staff travelled to affected areas of Sierra Leone to provide assistance on the ground. Together, they speeded up diagnoses, resulting in up to 250 samples per day. More widely, the UK Government has funded vaccine trials and research into Ebola to ensure lessons are carried forward to events such as the recent Zika outbreak. Every day the Intellectual Property Office (IPO) works to protect UK innovators and entrepreneurs, helping new inventions make their way to market. Inventions such as Sugru, the mouldable glue that can be used to fix and modify anything from shoes to dishwashers, created by Jane Ni Dhulchaointigh when she was a student at The Royal College of Art. During the British astronaut Tim Peake’s Principia mission to the International Space Station (ISS), he ran experiments that cannot be done anywhere on Earth, as well as trying out new technologies for future exploration. In connection with Tim’s mission, the UK Space Agency carried out an educational outreach programme for young people to increase interest in STEM subjects and inspire the next generation of scientists and engineers. How is the GSE story being used? We published a blog and link to the GSE Story in September. To date, there have been 1,176 views on SlideShare, and GDS analytics show that in the first week there were 1,040 viewers. GSE members who have read the story say it makes them feel proud to be a scientist or engineer in government, with 46 volunteering to become champions to raise the profile of GSE. We have had 524 new recruits to the profession since launching the story. What next for the GSE story? We have learnt so much through this creative process. Eye-catching use of art and design in the cartoon images has helped us to connect with a diverse audience and demystify our work. The images have been used to develop a visual brand for the GSE profession. They feature heavily throughout our strategy, capturing an identity that was difficult to express in words alone. We are keen to share our experience with other professions, in particular the other analytical professions that may face similar communication and identity challenges. * The five Civil Service analytical professions include: Government Science and Engineering (GSE), Government Economic Service (GES), Government Social Research (GSR), Government Operational Research Service (GORS), Government Statistical Service (GSS).